Sodium is one of the most prolific elements on Earth, and the most plentiful of the Alkali metals. Sodium is necessary for regulation of blood and body fluids, transmission of nerve impulses, heart activity, and certain metabolic functions. Sodium’s main job is to regulate the amount of water inside and outside the cell. The kidneys get involved when too much sodium enters the blood and they will help to excrete the excess sodium through urine. In cases where the body has become sodium sensitive, the body will retain that excess fluid in the blood and cause increased blood pressure. While it is essential for many body functions, as well as being an essential Enzyme for performance, overconsumption can cause long term health risk. Risks of high sodium can include electrolyte imbalance, high blood pressure/hypertension, or eventual cardiovascular disease. When considering sodium needs of active individuals, or athletes, however we have to consider the amount of salt lost through sweat, and urination. You can assess this by weighing yourself before and after a bout of training. 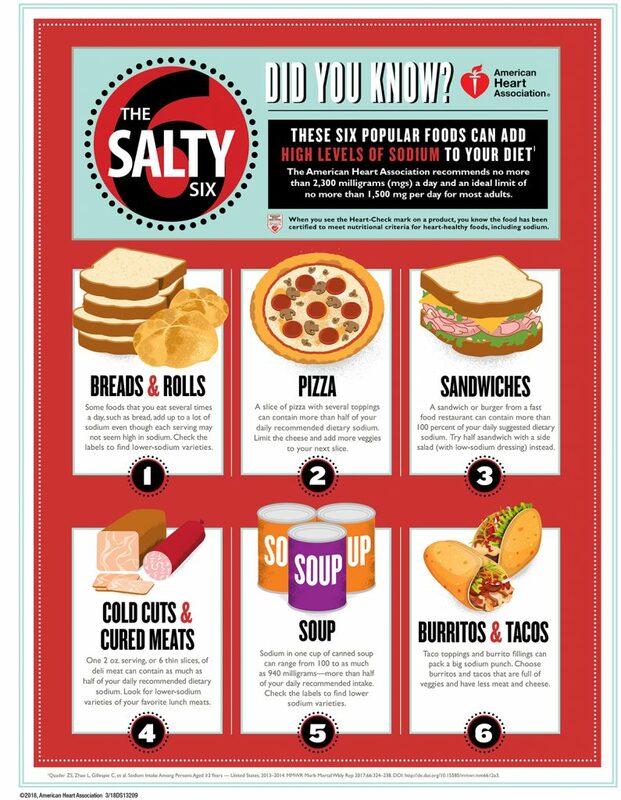 On Average we lose 500mg of sodium per lb. of water weight lost. So, if you lose 2lbs pre and post exercise, then you have lost 1000mg sodium Most of us, training for 45-60 minutes a day not need to strategically replace sodium, we will get it through our normal diet. But in the case of competitive athletes, who are often training 2-4 hours a day, they may be losing 2000-4000mg per day. In such cases, it is essential that they track and replace lost sodium through consumption of salty foods, or a supplement like sports drink or electrolyte tablet. What I tell my clients…you cannot avoid sodium nor can most of commit to simply never eating anything out of a box of can. Our 21st Century lifestyles involve eating out, on the go, convenience living. So, do what you can to minimize the impact? EXERCISE!! And sweat some of it out. Choose “No Salt Added” options where you can. Canned soups, beans, vegetables, tuna, tomatoes. Avoid Lunch meats, or if they are a must try the Low Sodium versions. Check out some salt free options like Mrs. Dash or fresh herbs and spices for flavor to avoid sodium ridden marinades and seasoning packets.